Will 140,000 refugees in Thailand seeking safety from the world’s longest-running civil war ever be able to go home? 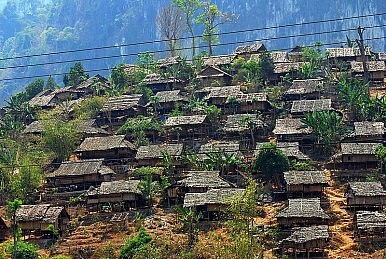 From the main road, Mae La looks much like a traditional Thai village. Smoke rises from thatched, wooden homesteads which straddle a hillside carved up by dirt tracks. Close to the Burma border, Mae La is the largest of 10 refugee camps in Thailand and has since 1984 served as a home to tens of thousands of refugees fleeing the world’s longest-running civil war in adjacent Karen State. But since a ceasefire between the Burmese army and Karen rebels signed in January and government reforms, Human rights groups and aid agencies have started talking of the possibility that many of Thailand’s roughly 140,000 Burmese refugees may soon return home. The vast majority are Karen, while the other main minority – the Karenni – is also starting to look at repatriation. Still, Dah Eh Kler, general secretary of the Karen Women’s Organization (KWO) which monitors conditions on both sides of the border, suggests an area which has seen over 60 years of warfare will take time to support normal, everyday life. “We are encouraged by the changes in Burma but there are many improvements that would need to happen before refugees would be safe to return,” she said. The most pressing concern coming out of recent repatriation discussions with refugees is the presence of Burmese Army soldiers strategically positioned throughout the long, thin strip of land that is Karen State. During a third round of peace talks this month, the Karen National Union (KNU), the political wing of the insurgents, made a request to the Burmese government’s chief negotiator Aung Min that the army withdraw soldiers from areas close to Karen villages. They are still awaiting a response as President Thein Sein’s office consults with the Burmese Ministry of Defense. Karen State remains one of the most heavily mined areas on the planet, another major concern for returning refugees, many of whom have already lost legs in the jungle. Up until at least the end of last year, reporting in the area by the Karen Human Rights Group suggested both the Burmese Army and rebel Karen National Liberation Army were still laying anti-personnel mines. Phil Robertson, deputy Asia director for Human Rights Watch (HRW), says that although the Burmese Army has started to use bulldozers to clear mines, this remains a haphazard process. Some mines are signposted with skull and crossbones, but hundreds lie hidden.